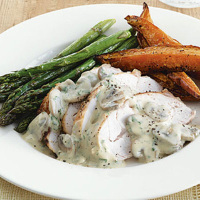 Dinner couldn't be easier with our chicken joint, a simple sauce and seasonal English asparagus. Preheat the oven to 190°C, gas mark 5. Roast the chicken joint for 50 minutes. Ten minutes before the chicken is ready, lay the asparagus on a baking tray and drizzle with 1 tablespoon of the olive oil. Season and roast in the oven alongside the chicken. Meanwhile, make the sauce by heating the remaining tablespoon of olive oil in a small saucepan. Add the mushrooms and fry for 2-3 minutes until soft. Stir in the mustard and stock. Add the crème fraîche and stir into the sauce with the parsley. Season with freshly ground black pepper. Slice the chicken joint and serve with the sauce, roasted asparagus and chunky roasted sweet potato wedges. Cook the sweet potatoes alongside the chicken for about 30-40 minutes. The flavours in the fresh mushroom sauce make it ideal for serving with grilled steaks, too. Try other ready-to-roast joints from our easy... range, such as Chicken Breast Joint with a Leek & Crispy Bacon Stuffing.